Over-braking - Braking too hard and locking up the wheels. Skids also can occur when using the speed retarder when the road is slippery. Over-steering - Turning the wheels more sharply than the vehicle can turn. Over-acceleration - Supplying too much power to the drive wheels, causing them to spin. Driving too fast - Most serious skids result from driving too fast for road conditions. Drivers who adjust their driving to conditions do not over-accelerate and do not have to over-brake or over-steer from too much speed. By far the most common skid is one in which the rear wheels lose traction through excessive braking or acceleration. Skids caused by acceleration usually happen on ice or snow. They can easily be stopped by taking your foot off the accelerator (if it is very slippery, push the clutch in. Otherwise, the engine can keep the wheels from rolling freely and regaining traction). Rear-wheel braking skids occur when the rear-drive wheels lock. Because locked wheels have less traction than rolling wheels, the rear wheels usually slide sideways in an attempt to “catch up” with the front wheels. 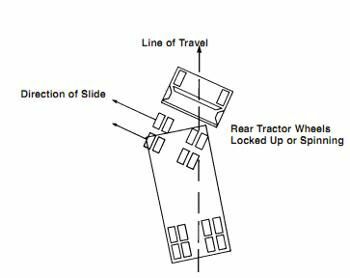 In a bus or straight truck, the vehicle will slide sideways in a “spin out.” With vehicles towing trailers, a drive-wheel skid can let the trailer push the towing vehicle sideways, causing a sudden jackknife (see Figure 2-15). Stop braking - This will let the rear wheels roll again and keep the rear wheels from sliding any further. If on ice, push in the clutch to let the wheels turn freely. Turn quickly - When a vehicle begins to slide sideways, quickly steer in the direction you want the vehicle to go down the road. You must turn the wheel quickly. Counter-steer - As a vehicle turns back on course, it has a tendency to keep right on turning. Unless you turn the steering wheel quickly the other way, you may find yourself skidding in the opposite direction. Most front-wheel skids are caused by driving too fast for conditions. 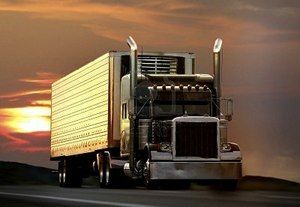 Other causes are lack of tread on the front tires, and cargo loaded so not enough weight is on the front axle. In a front-wheel skid, the front end tends to go in a straight line regardless of how much you turn the steering wheel. On a very slippery surface, you may not be able to steer around a curve or turn. These questions may be on the written exam. If you cannot answer all of them, study Sections 2.15 and 2.16. The first thing to do at an accident scene is to keep another accident from happening at the same spot. If your vehicle is involved in the accident, try to get it to the side of the road. This will help prevent another accident and allow traffic to move. If you are stopping to help, park away from the accident. The area immediately around the accident will be needed for emergency vehicles. Set out reflective triangles to warn other traffic. Make sure they can be seen by other drivers in time for them to avoid the accident. Do not put road flares on the ground near wrecked vehicles. Road flares could ignite any leaking flammable liquids. If you have a CB, put out a call over the emergency channel before you get out of your vehicle. If not, wait until after the accident scene has been properly protected, then phone or send someone to phone the police. Try to determine where you are so you can give the exact location. Do not move a severely injured person unless the danger of fire or passing traffic makes it necessary. Stop heavy bleeding by applying direct pressure to the wound. While you probably don't need to memorize these definitions, you should be familiar with the meaning of each. This is a simple concept, but one which comes up from time to time on the written exam. Just understand that to stop an acceleration skid, you need to take your foot off the accelerator. A jackknife occurs because the trailer tires have less traction than the tractor tires (or the tractor tires have less traction than the trailer tires). The only way to correct a truck or trailer jackknife is to somehow regain traction. This usually requires that you release the brakes so the wheels can turn freely. While you don't need to memorize the below list, you should familiarize yourself with these concepts and be prepared to answer questions about this on the written exam. Some questions may be asked about a front wheel skid and how to correct it. This is very important! The below list should not only be memorized, but should be memorized in order. Questions about accident procedures are asked about very frequently on the written exam. You have to know what to do and in what order to do it. Study this until you have the order memorized! You should absolutely never move an injured person unless you are qualified to do so or the person's life is in immediate danger due to fire or passing traffic. The best thing you can do is protect and secure the accident scene and wait until professional help arrives. When at the scene of an accident with injuries, when should you assist the injured? If you're involved in an accident and not seriously hurt, you should do the following in which order? Protect the area - The first thing to do at an accident scene is to keep another accident from happening at the same spot. Notify Authorities - If you have a CB, put out a call over the emergency channel before you get out of your vehicle. If not, wait until after the accident scene has been properly protected, then phone or send someone to phone the police. Try to determine where you are so you can give the exact location. As long as you always practice safe driving techniques, you probably will never be involved in a major accident. However, it is very likely you'll see a major accident occur or be one of the first people on scene. First and foremost, remember to protect yourself. Many good samaritans end up injuring themselves by stepping into a traffic lane, slipping on fluids spilled onto the roadway, or cutting themselves on debris from the accident. Don't become another victim! While using road flares may be ok in some situations, remember that after an accident, flammable liquids may leak and spread along the ground, so it's best to use warning devices which don't have an ignition source, such as reflective warning triangles. What is a reason Drive-Wheel Skids occur? Rear-wheel braking skids occur when the rear-drive wheels lock. When involved in an accident, when should you notify authorities? Rear-wheel braking skids occur when the rear-drive wheels lock. Because locked wheels have less traction than rolling wheels, the rear wheels usually slide sideways in an attempt to "catch up" with the front wheels. In a bus or straight truck, the vehicle will slide sideways in a "spin out." With vehicles towing trailers, a drive wheel skid can let the trailer push the towing vehicle sideways, causing a sudden jackknife. Stop braking This will let the rear wheels roll again and keep the rear wheels from sliding any further. If on ice, push in the clutch to let the wheels turn freely. Turn quickly When a vehicle begins to slide sideways, quickly steer in the direction you want the vehicle to go down the road. You must turn the wheel quickly. Countersteer As a vehicle turns back on course, it has a tendency to keep right on turning. Unless you turn the steering wheel quickly the other way, you may find yourself skidding in the opposite direction. Learning to stay off the brake, turn the steering wheel quickly, push in the clutch and countersteer in a skid takes a lot of practice. The best place to get this practice is on a large driving range or "skid pad." Front-Wheel Skids - Most front-wheel skids are caused by driving too fast for conditions. Other causes are lack of tread on the front tires, and cargo loaded so not enough weight is on the front axle. In a front-wheel skid, the front end tends to go in a straight line regardless of how much you turn the steering wheel. On a very slippery surface, you may not be able to steer around a curve or turn. What is the best way to recover from a Front-Wheel Skid?